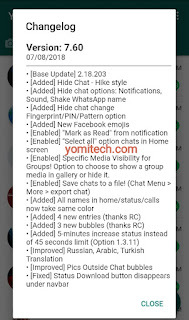 YoWhatsApp which is arguably one of the best modded version of WhatsApp has just released a new update which is the version 7.60. YoWhatsApp is a modified version of the official WhatsApp application and it is developed by Yousef Al-Basha. The latest YoWhatsApp V7.60 comes with a lot of new features and improvements. WhatsApp is no doubt the most popular social messaging platform at the moment with over 1 billion active users. The App comes with a lot of really cool features and functions, but with the modded version, you definitely get more features and control over the App than you will with the stock App. There are different types of Modded WhatsApps such as GBWhatsApp, WhatsAppPlus and many other, but YoWhatsApp still remains one of the best out there. With YoWhatsApp, you can theme up and customize your WhatsApp UI, hide last seen, download status pictures/videos, use more than one WhatsApp account on the same device and many more. >> Regular Updates: YoWhatsApp is always updated to the latest version of WhatsApp which is available for everyone on Google Play Store. This means that your latest Yo WhatsApp will always be an updated base WhatsApp. 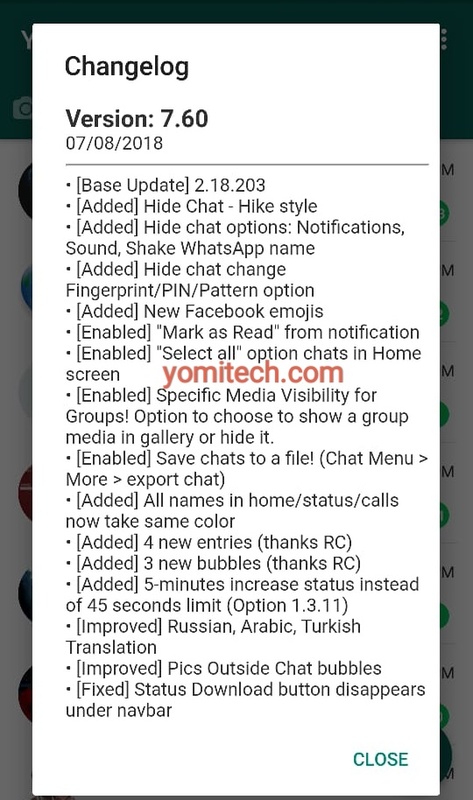 >> Set Image as background for Home screen: On YoWhatsApp you can easily change the background or chat conversation background image. >> Chat Bubble feature: You get the option to customize your chat bubble to however you want it to be. >> Freeze Last Seen: You can freeze the last seen of your WhatsApp. This feature is available in all the modded version of WhatsApp. Freezing your last seen means that nobody will know when you are online or offline. >> Call Blocker: On YoWhatsApp, you can block someone from calling you without actually blocking them from chatting with you. You can also disable the call feature completely. This is one of the features that is not available on the official WhatsApp App. >> White Navigation bar support for Android 8.0+: If you have Android 8.0+ then you might have seen Android Oreo has a complete white theme. You can change the colour of your navigation bar with the help of YoWhatsApp. >> Icons: YoWhatsApp provides you with different icons to choose from if you don't want to use the stock icon. >> YoThemes: If you want to install someone else WhatsApp theme or design your own WhatsApp theme then there is a feature in YoWhatsApp which will help the users to theme their WhatsApp however they need and from the store they can download the theme for their device free. >> Save Themes: If you are good at creating themes then you can store your theme in zip format and share them with your friends. 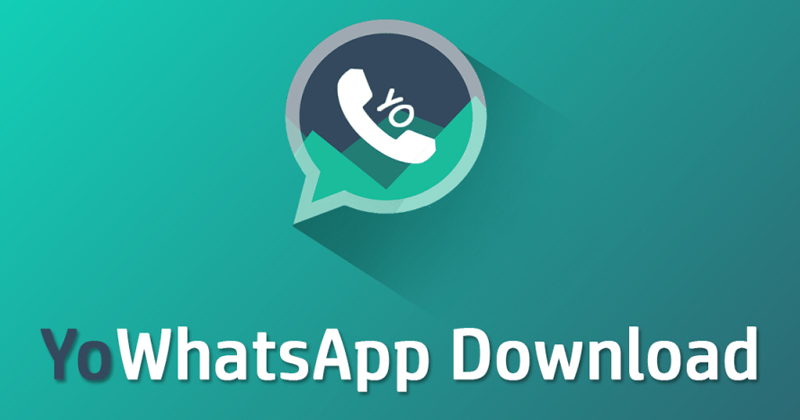 >> No Root: YoWhatsApp does not require root access to run smoothly o your smartphone. >> Lock YoWhatsApp: You can lock your YoWhatsApp with an inbuilt feature which helps the user to do so in just a few clicks. You can close your WhatsApp with the help of pin, pattern and fingerprint. >> Custom Privacy: Custom Privacy is the feature which helps the users to Hide blue ticks, second tick, blue microphone, typing, and recording. >> Emoji Variants: There are the different version of emoji which you can use with the help of YoWhatsApp. You can use emoji of Facebook, Emoji One, Twitter, Android Nougat, iOS 9 Flat. >> Copy Chats without Date and Time: YoWhatsApp allows you to copy chats without date and time which means there is no need to delete the date and time of conversations before copying and pasting. >> Send 700 MB Videos: If you want to send your friends any movies then you can do so with the help of YoWhatsApp, and you can share any files without any limits. >> WhatsApp Status Above 250 Characters: You can post WhatsApp status on YoWhatsApp above the 250 characters limit. >> Zoom Profile Pictures in Double Tap: YoWhatsApp lets you quickly zoom in and out on any profile picture. >> Copy Anybody’s WhatsApp Status by a Long Press: If you want to copy your friends WhatsApp status. You can do so by clicking on your friends WhatsApp status, and that’s done you have successfully copied your friends status. >> Material Design: If you are a material design fan then you are going to love this application because of YoWhatsApp features new teal design. Note: If you are unable to install the com.yowa., then download and install the com.wa. instead.